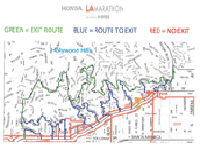 The 33rd edition of the LA Marathon will be the eighth time the course will start at Dodger Stadium and end in Santa Monica, incorporating many iconic landmarks for which Los Angeles is world renowned. No free Main Street Farmer’s Market parking in the beach lots on March 18. You can either board a shuttle, be dropped off at the start line, or drive yourself to the start line. This year, you may board shuttles at the below locations (restrictions apply). 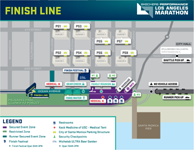 See https://www.lamarathon.com/participant-info/parking/shuttles/ for details. Participants will be allowed to park their vehicles at Dodger Stadium. 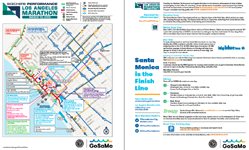 However, NO SHUTTLES will be available after the race to bring you back to Dodger Stadium. 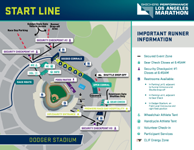 You will need to make your own arrangements to return to Dodger Stadium if you chose to drive yourself to the start line. Cars will NOT be allowed to park overnight at Dodger Stadium between Sunday, March 18th and Monday, March 19th. Please retrieve your vehicle by 8 PM on March 18, 2018. Vehicles left in the lot after 8 PM are subject to tow at their owner's expense. Yes, participants will be allowed to park their vehicles at Dodger Stadium. However, NO SHUTTLES will be available after the race to bring you back to Dodger Stadium. 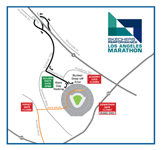 You will need to make your own arrangements to return to Dodger Stadium if you chose to drive yourself to the start line. Cars will NOT be allowed to park overnight at Dodger Stadium between Sunday, March 18th and Monday, March 19th. Please retrieve your vehicle by 8 PM on March 18, 2018. Vehicles left in the lot after 8 PM are subject to tow at their owner's expense.